May 16th and 17th, 2018 at the UC Sierra Foothill Research and Extension Center, 8279 Scott Forbes Road, Browns Valley, CA. 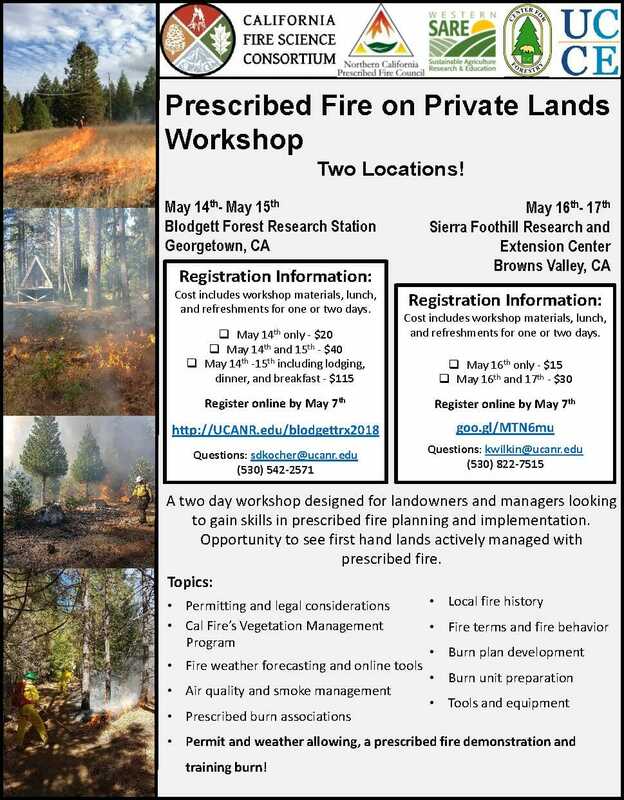 Each workshop will feature similar content, however the first workshop will be held in a forested setting featuring prescribed fire in forested areas and the second in a rangeland setting featuring prescribed fire in rangelands. The first day of each workshop will include presentations on prescribed fire, including local fire history and current fire research, prescribed fire permitting and legal considerations, fire weather forecasting and online tools, air quality and smoke management, fire terms and fire behavior, burn plan development, burn unit preparation and fire tools and equipment, as well as models for accomplishing prescribed fire on private lands, including prescribed burn associations and Cal Fire’s Vegetation Management Program. The second day of each workshop will involve a field trip to look at lands actively managed with prescribed fire and a live training burn (weather permitting). Registration by May 7th is required to participate. 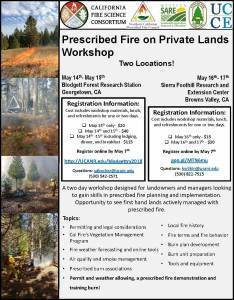 Please go to http://ucanr.edu/2018rxfireworkshops for registration information and costs. After registering, you will be provided with further instructions on the workshop and the agenda of presentations.